This research aims at improving students’ skills in writing descriptive text through Genre Based Approach Assisted with Instagram. It is a classroom action research. It was conducted at State Junior High School 2 of Banjarnegara in the academic year 2017/2018. 30 students of 7H were assigned as subjects of the research. Data was collected within the cycles through tests, classroom observation, and documentation. Tests were conducted within pretest, test of Cycle I and test of cycle II. It used test sheets, observation guidelines, and documentation guidelines as the instruments. Data was analysed using qualitative descriptive method. Results shows that students take an active role in their learning activities. The quality of their writing also gets improved. Their writing scores increase from 62 (pretest), 68 (cycle I), then 71 (Cycle II). 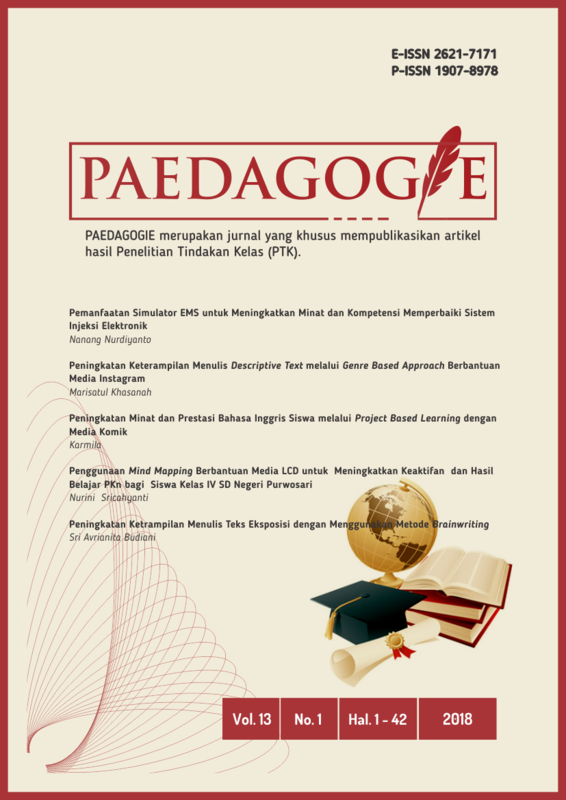 Thus, the hypothesis is accepted which means that Genre Based Approach Assisted with Instagram improves students’ skills in writing descriptive text.